Sportswriters are premature annunciators. We want to be the first to have the last word, the final say. Some reasons for that are good. The best is the immediacy and the depth of our response to sports. We hunger for words to express that response and we often turn to sportswriters to give them to us. The sportswriter feels that hunger, both feels it in himself (as a fan) and feels its presence in others. The hunger creates pressure to say something, say something now, and say something somehow permanent. Ezra Pound warned that beauty is difficult—so too is permanence. Better, probably, not to try for it. This year’s Iron Bowl took shape in a white-hot cauldron of hype and hate. Alabama fans felt entitled to victory, and annoyed that anyone—Auburn player, Auburn fan, media commentator—might question that entitlement. Auburn fans craved redemption, and bristled at any suggestion the craving might go unsatisfied. But what terrified each fan base most was staggering under a loss before the jeers of the other fan base. In this state, for the fans, no Iron Bowl loss goes unpunished. Most of the time, because the game so often goes to script, fans can prepare themselves for punishment, at least expect it if not admit to expecting it. But this game made it hard to remember to prepare, or to stay prepared. There were too many moments for hope, too many moments when the game promised all that could be hoped for—for truly soul-stirring victory. And fans became engrossed and fully invested—no holding back. Forget preparing for defeat; we are going to win! A table has been prepared for us in the presence of our enemy; our cup is about to run over! One second left. Alabama lined up for a field goal. I watched in disbelief. Surely time had run out. Surely Saban wasn’t going to (try to) win like this—begging for more time, kicking a field goal and sneaking out of Jordan-Hare with a win. As Shunderson said to Prof. Elwell in People Will Talk: “…You’re a little man. It’s not that you’re short. You’re little, in the mind and in the heart.” Could it really end like this, after Auburn’s heroics, after Marshall’s sweet sucker pass to Sammy Coates to tie the game? But Saban was going to kick it. That was his plan. Malzahn called timeout. Saban likes to ice kickers. Now he can kiss Malzahn’s ice. But there wasn’t just icing going on. Auburn coaches doubted that the Tide kicker could actually get the ball all the way to the goal posts, and so they put a man back deep, eventually settling on Chris Davis. Evidently, Saban did not notice or did not care. The little general was bent on his plan. The kicker struck the ball and it climbed high into the night sky. For a second, it looked good. Then it became clear that it was short. I refocused from goal post to Chris Davis as he caught the ball deep in the end zone. He ran out of the end zone. “You don’t beat the champ if you don’t knock them out.” Gary Danielson said that, with about ten minutes to go. Just after that, Malzahn went for it on fourth and one. Auburn got stuffed. Alabama had just hit a 99-yard pass play. Saban clearly thought his offensive line could impose his will on Auburn. 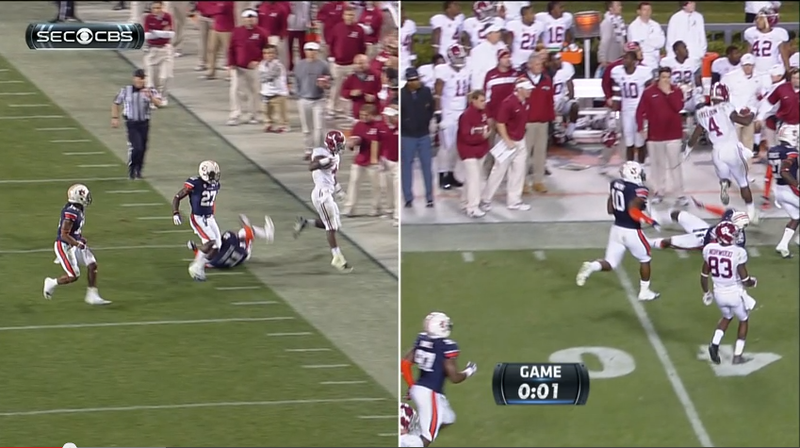 But Auburn stuffed a fourth down play, and then a few minutes later, another. Evidently, you don’t beat Auburn if you don’t knock them out, either. Third and nineteen, four minutes to go. 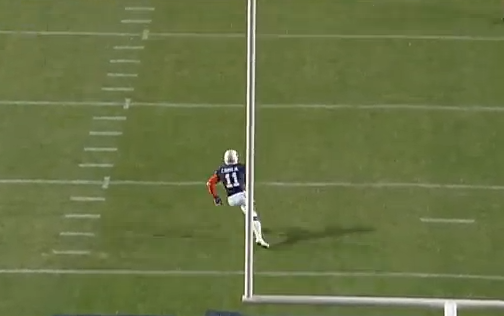 Nick Marshall drops back deep into the end zone and heaves the ball toward Ricardo Louis. 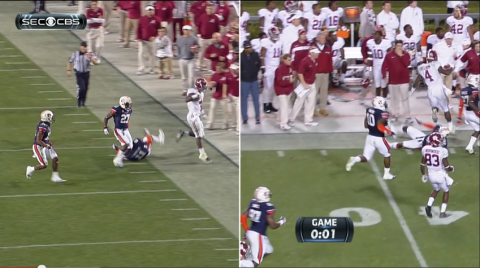 Just as Auburn had on the 99-yard pass they gave up, Alabama botched coverage. But Marshall threw it a foot or two too far. It had the feeling of the last best chance that Auburn would have—and it produced nothing. Auburn hadn’t been knocked out, but they hadn’t knocked out Alabama either. Alabama led by seven on the judge’s card, the scoreboard. After a holding call on a run that might have won the game, Alabama decided to try a field goal again. It was blocked. Auburn began to drive. Mason moved the chains. And then Marshall found Sammie Coates. Just like that, tie ball game. Alabama then went back to the tactic they had used to end the half. Draw plays to Yeldon. On the second, Yeldon went out of bounds with no time left. Or with one second left. With one second left. The Tide quarterback exited the field. He kissed some folks then jogged into outer darkness. 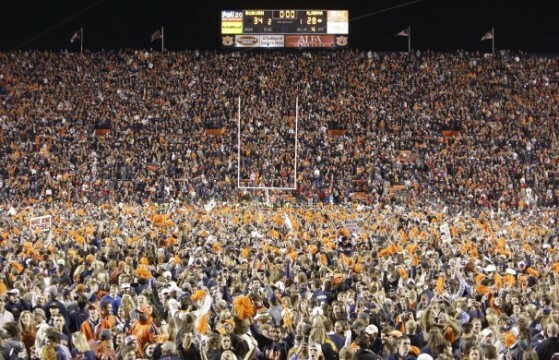 Auburn fans jumped about madly, unable to contain themselves. Davis had just run 109 yards, not just into the end zone, but into football heaven, into immortality: the ladder between heaven and earth had become horizontal, not vertical. For both Auburn and Alabama fans, the focal emotion of the moment, joy or despair, was mixed with peripheral disbelief. It couldn’t have ended this way (Oh my God, yes! Oh, my God, no!). It had just ended this way. I bounced up and down in wordless delirium. Bad knees be damned. For about two minutes, I was disincarnate, a pure spirit, weightless, ubiquitous. Wherever two or three Auburn fans were screaming together, there I was screaming also. Saban made crucial mistakes; in the midst of all the championships he was indeed just a man. He is a good coach, but not a coach sui generis, not a breed apart. And his team is just a team, a good team, different from other teams merely in degree, not in kind. He and they were, well, vincible. We had just vinced the hell out of them. Permanence in words is hard. Words shift, bend, break. They won’t stay put: you can’t step into the same sentence twice. Sometimes even those of us who love words the most, who care about them and tend to them for a living, have to recognize that, for all their power, they fail. And sometimes all you can do is let them fail, let them go, let them fall, and simply be the thankful, insensible, tremulous joy that you cannot speak. Related: Night Brooded Over Jordan-Hare: An Auburn philosophy professor goes deep on The Miracle. Your words do not fail. No, no they don’t. WDQ, I thought the same thing. Great piece…my wife who is not really a football fan..but an English major in college always enjoys the good philosophers epistles. Keep it up. A friend on the west coast called after the game…said something about “speechless in Seattle”.. AU made millions of fans across the US with that one play. Well those words certainly didn’t fail.. thank you!